WIT Students’ Union organised Road Safety Awareness Week. As a result of the huge effort put in to ensure awareness in Road Safety WITSU were honoured with winning a Leading Light in Road Safety Award. WITSU were chosen as the winner in the ‘Education – Third Level’ category. The winners were selected by a judging panel comprising of Miriam O’Callaghan, RTÉ, Gay Byrne, Chairman of the RSA, Ger Colleran, Editor of the Irish Daily Star, Cathy Farrell, Head of News, Today FM, Scott Ahearn, Welfare Officer, USI, Joe Reynolds, Reynolds Logistics and Hugh O’Neill, Chief Fire Officer, Dublin City Council. 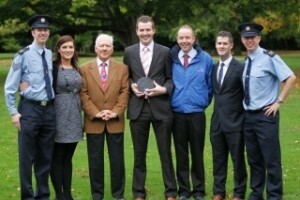 The award was presented by Mr Gay Byrne at a ceremony in Farmleigh, Dublin, on Wednesday, 12 October 2011. Representatives from WIT Students’ Union and the Waterford local Community Gardaí were in attendance to receive the award. The photograph above shows Garda Gavin Hegarty, Cathy Pembroke (past WITSU President), Mr. Gay Byrne, Conor Doyle (WITSU President), Barry Ryan (Waterford Driving Academy), Patrick McDonald (past WITSU Welfare Officer), Garda Aidan McCarthy.